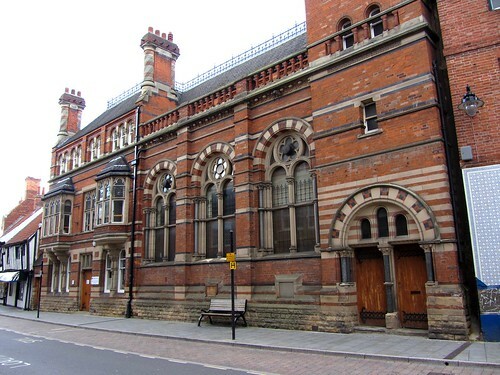 Italian Gothic Revival style building designed by Watson Fothergill in 1887 as bank and manager’s house for Nottingham and Notts Bank. Now the Violin Making School, Newark and Sherwood College. This building is a virtually intact example of the idiosyncratic work of Watson Fothergill. Red brick, with blue brick, terracotta and stone dressings and gabled and hipped plain tile roofs. Single ridge and 2 side wall stacks, the latter with twisted double shafts. Italian Gothic Revival style. hall with plinth, string courses, stepped pilasters and coped balustrade, which extends to the right to form a balcony to the tower. 3 full height transomed windows with shafts and panel tracery. again, 2 round headed plain sashes opening onto the balcony. Bell stage has on each side a round headed recess with hood mould, containing 3 round headed plain sashes with shafts. flanked by single square oriels cross mullioned windows, that to the right being smaller and simpler. Above, 3 double and one triple round headed plain sashes with shafts on corbels. Central shouldered 2 leaf door with mullioned overlight, flanked to left by a 3-light shouldered plain sash with shafts, and to right by a pair of similar 2-light windows. The shafts form supports to the oriel above each window. To the far left, an entry door with tiled canopy and stone lintel. (The listing text, ref Buildings of England: E Williamson: Nottinghamshire: London:1979-: 195).